When the kids are hungry and the fruit bowl just isn’t cutting it, you want some healthy snacks at your fingertips. Today we are sharing a perfect treat for those busy, on-a-go kind of days. 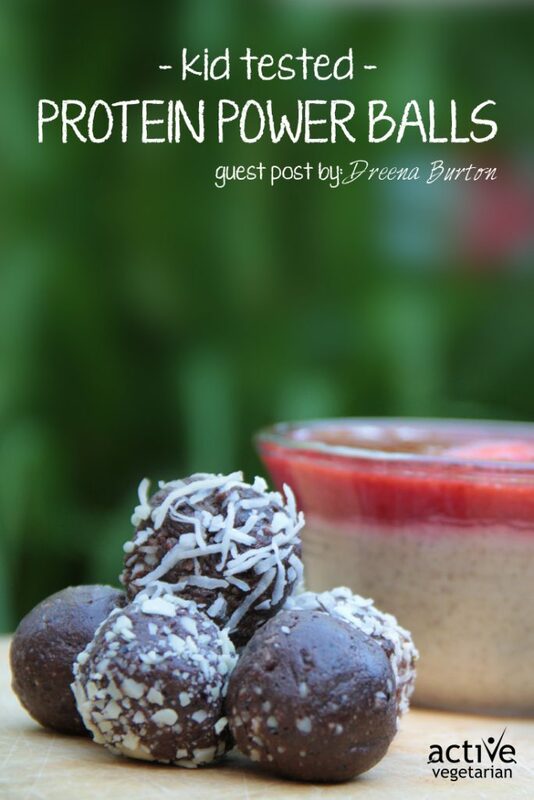 Dreena Burton from Plant Powered Kitchen created these Power Balls, for her girls who are pretty busy with hockey and sometimes they take off to games for hours and need some nutritious wholesome snack. Nikki and I like to pack few of them with us on our bike ride – they make a great easy to eat snack with extra boost of protein. Wholesome on-a-go snack with a boost of protein. In a food processor, process the pumpkin seeds, coconut flour,hemp seeds, and sunflower seeds until fine and crumbly. Add the dates and process through until they are worked into the mixture and crumbly. Add the cocoa powder, Vega powder, see salt and vanilla extract and process again for minute or two. It will appear as if nothing is happening for few minutes! The mixture will just be whirring around in crumbs, but soon it will start to become sticky and form a ball on the blade. Stop the machine and remove the dough. Take 1-1 1/2 TBS scoop of the dough and roll in your hand. Repeat until you have rolled all of the dough. If you don't have coconut flour, you can use 3/4 cup of rolled oats. This protein powder has some stevia so adjust to taste for sweetness. Start with 2 TBS, and stop to taste the mixture before it's in a sticky ball. If you would like to add more, try another 1/2-1 TBS. If you have another favorite chocolate protein powder you would like to ad- go for it. If you don't want to use any protein powder, omit it, and make these simple changes: increase the cocoa powder to 1/4 cup total, add another 2 TBS of hemp seed, and another 2-4 dates, to taste. 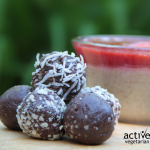 You can leave these balls uncoated, or roll in a dusting of coconut, cocoa powder, ground pumpkin seeds, or a combo! Looking for more healthy, kid-friendly snack ideas? Check out one of our favorite resources “Plant Powered Families -Over 100 Kid-Tested, Whole-Foods Vegan Recipes “ written by super creative real food mom!